A Night to Surrender (Spindle Cove) by Tessa Dare. Avon. 2011. And sequels. Library copies. The Plot: 1813, England. Victor Bramwell is a lieutenant colonel in the army, and he's been wounded, and all he cares about is getting back into the army. So he'll do anything to prove that he is fit to return. The Plot: 1813, England. Victor Bramwell is a lieutenant colonel in the army, and he's been wounded, and all he cares about is getting back into the army. So he'll do anything to prove that he is fit to return to service. Susanna Finch lives in Spindle Cove, along with her father. 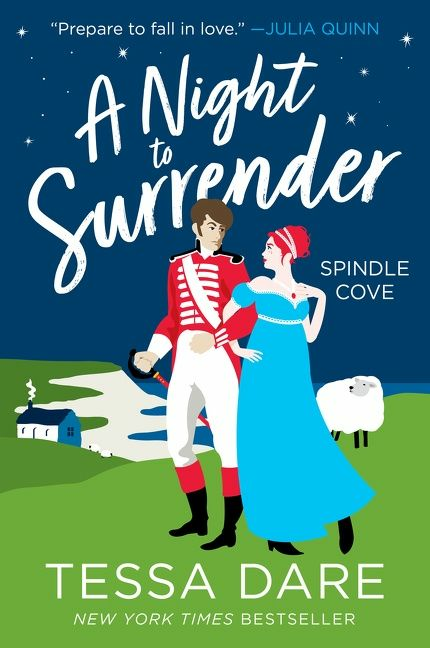 Spindle Cove has earned itself the nickname Spinster Cove, because it's so well known as a bit of a dumping ground for ladies who don't fit into society. It's full of spinsters, ha ha ha. And Susanna wants to keep Spindle Cove that way. She doesn't want people to know the truth about Spindle Cove: it's not a last resort. It's the best resort; a place where women who don't fit into society, or have been excluded, find a home and acceptance. Bram's mission to start a local militia is going to be tough -- even more difficult because, well, Spindle Cove is full of women. Not military service ready men. Will Susanna be able to get rid of Bram and his soldiers in time to save Spindle Cove? The Good: Spindle Cove! The shy and the introverted, but also the outspoken. The brainy. They are welcome and embraced and accepted at Spindle Cove -- at least, for now. A Night to Surrender is the first in a series, each about a different woman of Spindle Cove. Each there for a different reason. And, because of these reasons, it means the heroines of the series are each pretty unique, and independent. And it means that the heroes are those who value the unique. Spindle Cove is about women learning to be themselves, to be confident, and finding men who prize that. It's a feminist series, set in a time that isn't very feminist. The combinations are also interesting, because what matters are who the people are not what they are. Examples: a beautiful young woman and the local blacksmith. A Duke and a serving girl from a pub. Spindle Cove is also very funny. I confess, I didn't see it as much in A Night to Surrender, but the second, A Week to Be Wicked, had me laughing out loud. And after that, I saw a lot to laugh about. While Spindle Cove is about a safe place, it doesn't hide that the world itself can be harsh. There is a reason, after all, why a refuge like Spinster Cove is needed. The backstory in A Lady by Midnight shows what happens to a young woman without resources or family, who has no options, but who still has to live and to provide for her child. I have really enjoyed this series; so far there are four books and two novellas, with another novella this December and a new book next year. One nice thing about my recent romance reading is finding series like these, in which there are plenty of books in the series so I can power read one right after another. I love this series too! Funny and feminist. And I love the different layers of feminism, of independence. It's such a great series.